Tuesday’s arrival of the next crew members at the International Space Station had more excitement in store for the trio than expected when their Soyuz spacecraft suddenly backed out of its final approach to the orbiting laboratory and started backing away from its destination – requiring experienced Soyuz commander Yuri Malenchenko to manually dock the spacecraft. Soyuz commander Malenchenko joined by Flight Engineers Tim Kopra and Tim Peake lifted off aboard a Soyuz FG rocket at 11:03 UTC on a six-and-a-half-hour commute to the Space Station that started with a smooth ride atop the Soyuz FG. 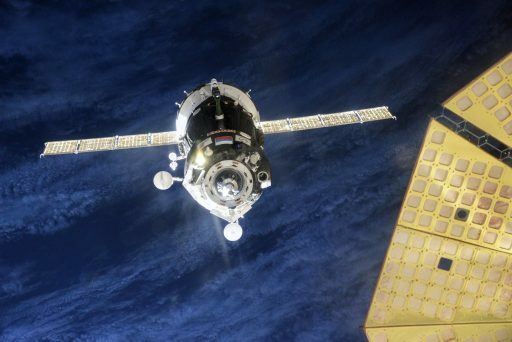 Released into an orbit of 207 by 253 Kilometers, the Soyuz TMA-19M spacecraft started its climb to the Space Station, chasing it down from behind and below by making a series of orbit-raising maneuvers that delivered the craft to the direct vicinity of ISS. 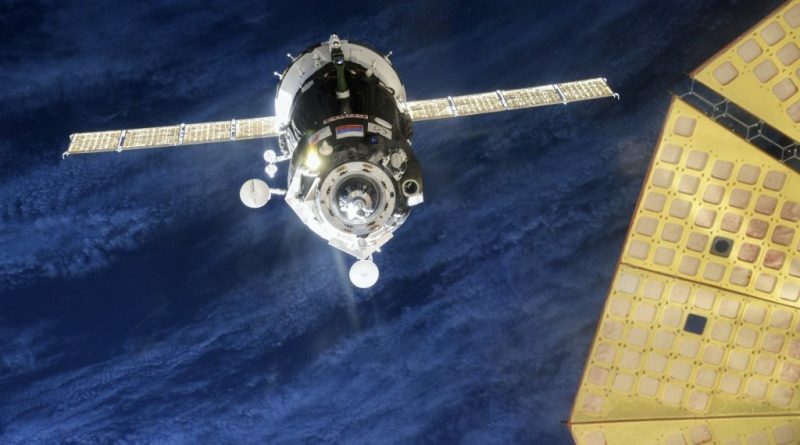 Beginning the process of linking up with ISS, the Soyuz activated its KURS Automatic Navigation System that uses radio signals sent from its KURS counterpart on ISS to guide the spacecraft to a fully automatic docking. Seated in the Entry Module of the Soyuz, the three crew members fulfilled a monitoring function as Soyuz made a slow lap around the Space Station for a docking to the Rassvet module at 17:24 UTC. Soyuz gently fired its thrusters to begin a straight-in approach to Rassvet and remained on target as it got closer and closer. When reaching 16 meters, Soyuz suddenly stopped and fired thrusters to initiate a rather swift opening rate, backing away from its docking port. Six-time space flier Yuri Malenchenko immediately assumed manual control and stopped the opening rate to begin the process of re-aligning the spacecraft with Rassvet and again get into position for an approach. Soyuz had drifted to a point where it took Malenchenko several minutes to maneuver back to a position aligned with Rassvet that had fallen into darkness as the sun had set while Soyuz was passing over Europe. To make it more difficult for the Mission Control Team in Moscow, Soyuz departed Russian Ground Station range and ISS was without Ku-Band coverage at the time, meaning that only the voice loop and Malenchenko’s commentary was available to follow the progress of the rendezvous. Overcoming initial difficulty to see the docking target, Malenchenko was able to align the spacecraft when still a few meters from Rassvet and bringing the vehicle in for a safe docking at 17:33 UTC. 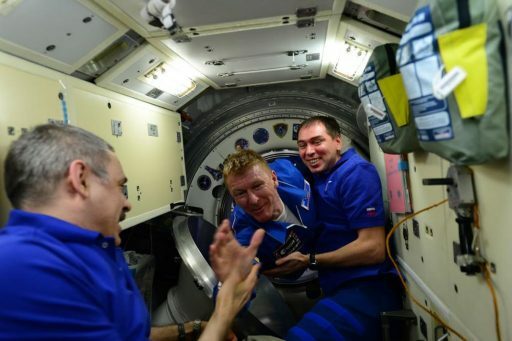 The three new crew members floated aboard their home in space just before 20 UTC where they were welcomed by the resident crew members after an arrival that certainly had more excitement in store than planned. It had not initially been clear what happened with the Soyuz on its final approach causing it to abort its automatic rendezvous, but the display of the Soyuz spacecraft delivered messages to the crew members indicating what had gone wrong. 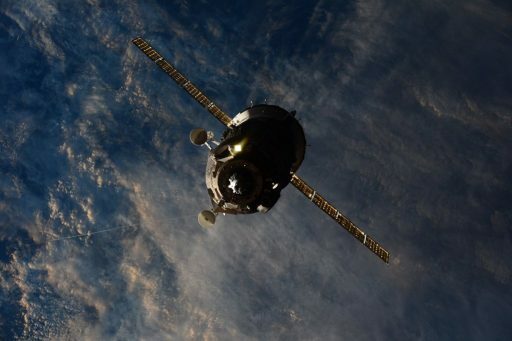 At 17:15:43 UTC, according to the spacecraft clock, the Flight Control System of the Soyuz provided a warning to the crew that an engine system had failed. An audible warning was also given to the crew and Malenchenko is heard annunciating the warning. 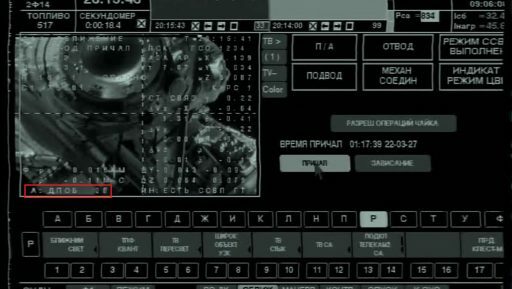 In the lower left corner of the video data overlay where caution messages appear in case of issues, the following message was shown: А: ДПОБ 20 – indicating a failure of the DPOB thruster number 20. 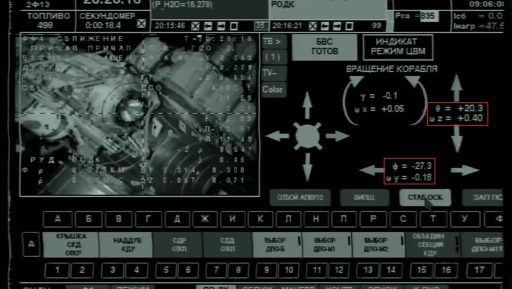 Also appearing in the data display was a message ‘Нет СДК недобор тяги по -Y (К1Б)’ annunciating that pressure data from the thruster in question, pointing to the -Y axis, had become off-nominal. In close succession, another message appeared: ‘Обобщенная авария (К1Б)’ – General Failure of DPO Thruster ‘Kollektor 1’. Normally, the automatic control system would switch to the backup string of maneuvering thrusters and continue the approach to the Station, but for some reason, the KURS system automatically commanded an abort maneuver, causing the Soyuz to initiate its retreat. Yuri Malenchenko assumed control of the spacecraft and attempted to bring Soyuz back under control and to a docking with Rassvet. However, in the first attempt, Malenchenko was unable to achieve a stable approach. Initiating the approach, recommended by Mission Control at a speed of 0.2 meters per second, Soyuz quickly reached a relative rate of 0.8m/s, much faster than would be appropriate. At less than 70 meters in range, Soyuz began turning its aft section to the left – Station aft, leading to a considerable misalignment with the docking port of over 27° according to the data provided by KURS. Malenchenko had to do quick work to stop the approach because the Soyuz had gotten rather close to the Space Station’s Zarya module with less than 25 meters between the Soyuz and ISS structure according to the KURS data output. He commanded a retrograde maneuver to back away from ISS and re-started the process of stabilizing the vehicle. For the second attempt, Malenchenko proceeded with more caution to make sure he had a good visual on the docking target which had not been the case for the first attempt. He closed in slowly and reported a good visual on the docking target and proceeded with the approach to a safe capture of the spacecraft. The DPO 20 thruster is located on the Transfer Compartment of the Soyuz Service Module that interfaces with the Entry Module. DPO 19 is located right next to the #20 thruster, both pointing to the -Y direction for translational maneuvers. DPO consists of 14 DPOB thrusters with a thrust of 129 Newtons and 12 DPOM thrusters with a lower thrust of 26 Newtons – all thrusters consume Nitrogen Tetroxide Oxidizer and Unsymmetrical Dimethylhydrazine Fuel. 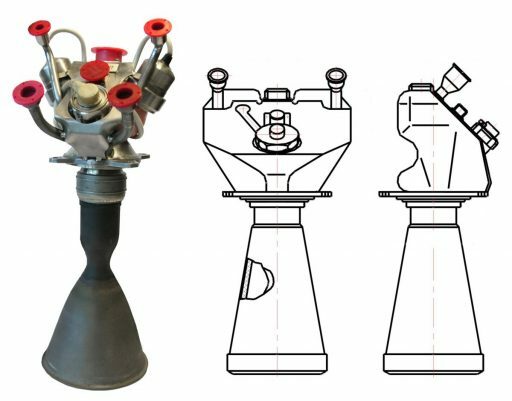 All DPOB thrusters and six of the DPOM thrusters are connected to the same propellant manifold – being fed through the same set of lines between the thrusters and the tanks. Each line has a number of safety and check valves and each engine can be isolated. A second manifold feeds propellants to the remaining six DPOM thrusters. The 11D428A-16 thruster measures 29 centimeters in length, weighs 1.5 Kilograms and operates at an inlet pressure of 1.8MPa. It can be used in pulse mode with pulses as short as 0.03 seconds and operate in steady-state mode for firings of several minutes. Nominal thrust is 129.16 Newtons and the engine achieves a specific impulse of 291 seconds. Arriving aboard the Space Station after some added excitement, Malenchenko, Kopra and Peake are set for a stay of six and a half months as part of Expedition 46/47, supporting hundreds of scientific experiments, transferring thousands of Kilograms of cargo to ISS, and supporting several spacewalks.